Making homemade caramel candy is not as hard as you think! I promise! You can have a batch of caramel cooling in a pan in the fridge waiting to be cut and wrapped in less than 20 minutes, and all you need is your microwave and a few ingredients! No candy thermometers are needed! The longest part is cutting and wrapping them, and your kids would love to help you with this part! I am making mine as a Mothers Day Gift, but they are perfect for that special friends' birthday, or of course the winter holidays. I prefer mine to be a soft chew and not too hard. The longer you cook these the harder the candy will be, so you can start with the times below and adjust to your own preference. Here's how I make mine. In large microwave safe bowl, melt butter. Add the rest of the ingredients and stir completely. Cook in microwave on high for 7 minutes. Take it out carefully (it's stinkin' hot!) and stir thoroughly, scraping the sides. Cook for another 7 minutes on high. Remove from microwave. Test consistency of caramels by dropping some into a cold glass of water. Pull the drop out of the water. The caramels should be hard enough to hold their shape and not ooze in your hand, yet soft enough to chew. Pour them into a greased pan. 9 x 13 will make thinner candies. I chose a 9x9 square pan and made them about 3/4 of inch thick. 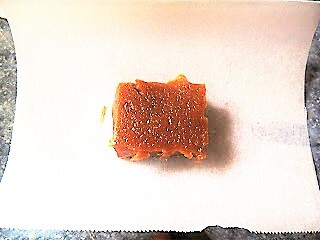 If you pour them in one size and quickly decide you don't like that thickness, then very quickly you can spray a different sized pan with non stick spray and transfer to a new pan and press down to spread the caramel. Set caramel in fridge for up to a few hours. Cut into squares, then wrap in wax paper or parchment paper squares.